Oldie but Goldie? There are certainly some modules that drifted out of focus, especially to new users of modular synthesizers. Today we will be retrospecting on modules that have been around for a long time and are still available. Looking back at the beginning of the eurorack format, it was quite easy to keep track of new developments – there was Doepfer from Germany and there was Analogue Systems from the UK. Both are still around and offer most of the modules they produced until today. And now it is even possible to put AS modules into a Doepfer System (the now “standard” eurorack) without buying an extra adapter, because AS modules are now available with compatible bus connectors – the Dual-Bus. There is the great sounding RS95e – a VCO that is always a good choice for thick vintage sound, an excellent choice for an oscillator with lots of character. Other often recommended modules by AS are: The Analogue Systems RS-510e which is based on the legendary EMS Trapezoid Generator and the excellent sounding RS-110 Multimode Filter – both great analog designs with a special twist! The RS-110 for example offers an open feedback-loop! The socket Res-Out and Res-In act like an insert i.e. they allow you to process the audio signal in the feedback loop by other audio processors like filters, distortions, delays, frequency shifters etc. 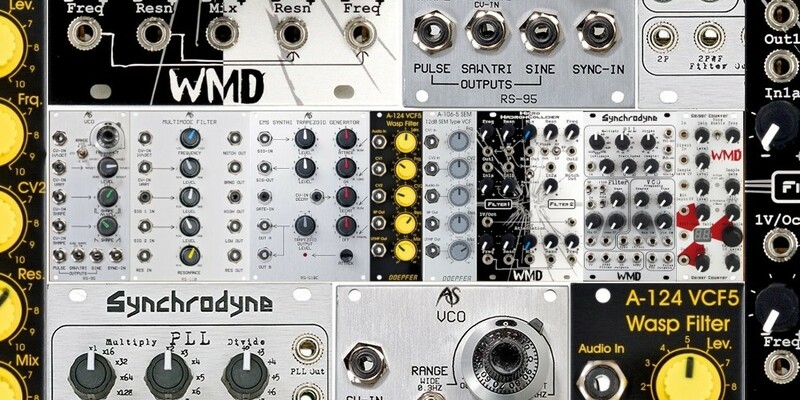 Doepfer also offers great filters, often very affordable compared to competitors and always real workhorses. For example the A-124 Wasp and A-106-5 SEM filter are not only two of the cheapest filters available, but also great sounding choices. They are based on vintage designs (obviously) and really do a lot of things right – these will most likely never leave your rack again, they are great sounding multimode-filters, cheap and small, while not being too fiddly. The Wasp is a great dirty and unstable design that gives your sound a lot of liveliness and power. The SEM is a smooth sounding and vibrant filter that works great (not only) for basslines. And there are more manufacturers that have been around for a while – for example WMD. Ever heard of the micro-Hadron-Collider, Synchrodyne or Geiger Counter – great names and great modules! All by WMD. These three modules have been available for several years now and all offer something special. What sets the uHC – a dual state-variable-filter – apart from most other VCFs is the integrated voltage controlled mixer. It can be used to create different and new filter modes – Wide Notch, Dual Bandpass, etc. It is also great for blending separate sounds together using both filters split and it allows cool frequency modulation of the mixed signals. The Synchrodyne is very interesting due to a combination of building blocks, which no other manufacturer packed together into one module. It contains most parts of a traditional synth-voice, but it goes a much different way. There is an analog sawtooth wave oscillator with a waveshaper, a “switched capacitor” filter and a PLL circuit which drives the cutoff frequency of the filter. HERE is a video of one (of many) possible uses of the Syncrodyne, this is so unusual that I had to add it. The WMD Geiger Counter is… another thing of its own…I wanted to say, but then there are about 5(?) different incarnations of this bit-crusher design! Only one of them is a eurorack module though. What they all share is a modern high gain preamp that drives an 8 bit computer, creating sounds which range from nice to unbelievably alien. Give. It. A. Try. Lots of normalizations and patch-points are typical for WMD modules, resulting in very complex, powerful and – in the end – rewarding designs. There are of cause more manufacturers and modules that deserve to be in this post, but let’s keep some for next time.